Between Bollywood action stars and aging starlets, vegetable vendors and child brides, the poems in Afternoon Masala describe the struggle of finding a place in the world to call home. Starting in the heated streets of Delhi and traveling through movie theaters and sound stages to kitchens and living rooms, the poems re-create a family’s immigration story, spotlighting the often troubled transformation from childhood to womanhood, from immigrant to American. 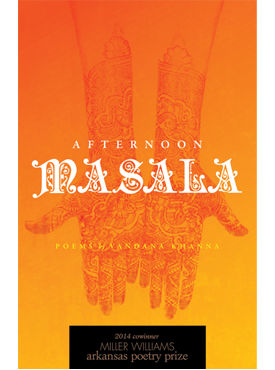 Filled with songs, spices, and mantras, Afternoon Masala embraces new worlds and old rivers, lost landscapes and love letters. Here both travelers and daughters alike reject their predetermined destinies for the distinct pleasures of a Hindi film, an unruly garden, a long-forgotten language. Vandana Khanna is an instructor at the University of Southern California and the author of Train to Agra. She is the 2013 winner of the Elinor Benedict Poetry Prize.